Asset allocation is the process of spreading or diversifying investments across a range of various asset classes and geographical regions. Asset allocation is essential for a financial investor to become successful and is an effective way to reduce the amount of risk that an investor’s portfolio faces. In the past, asset allocation was not the main focus for investors. Instead, investors and advisors spent their time selling products and security selections. Today, asset allocation strategies are being utilized by more investors than ever before. In fact, asset allocation is one of the most important factors in determining the overall portfolio returns. However, asset allocation is only effective if it is done properly. 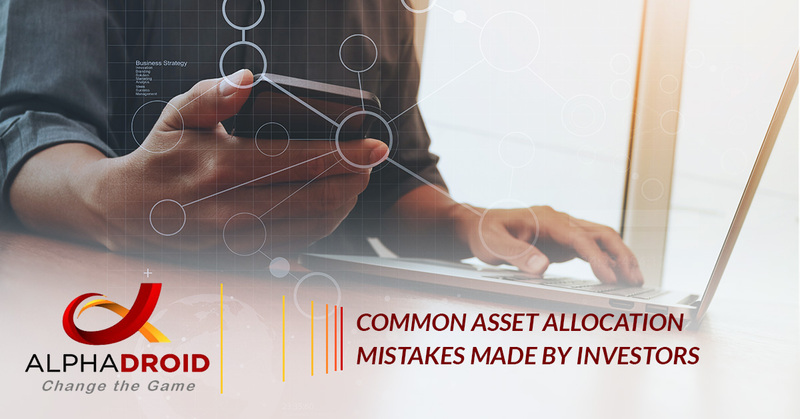 In order to help investors select a better asset allocation, we are going to discuss some of the common mistakes that investors should avoid. Believe it or not, many investors who save and invest do so in an undisciplined way. For example, some investors choose to invest solely because they know people who are investing in mutual funds or stocks. Others may be interested in investing due to an equity rise in the market. Others choose to invest because they have excess funds that they are clueless about where to deploy them and want to evaluate different options, such as fixed deposits or mutual funds. Having a lack of clarity or no clear objective or goal can lead investors to make the wrong investment decisions. Therefore, in order to determine optimal allocation, investors must first have their financial goals, risk tolerance, and investment time horizon clearly defined. When investors do not invest the right proportion in their desired asset classes, it will cause their portfolio to result in suboptimal returns. One of the most common mistakes investors make is allocating a sub-optimal portion of their investment portfolio to equity. It is important for investors to factor in the impact that taxes and inflation have in their investment planning. Investors must choose a suitable asset allocation for their risk and return needs. In addition, it is also vital that investors are aware that asset allocation is not only limited to the allocation between debt and equity, but it also includes other asset classes, such as cash, gold, and real estate. While most investors are focused on more important goals that are long term, many of them have a preference for assured return products. This emulates a short-term focus, which can leave investors short of their financial goals in the long run. While they do prefer assured returns that are free of risk, it is important for investors to understand that long-term assured returns are in inexistent. Another common mistake in asset allocation that investors make is setting an unrealistic return expectation. Doing this will often lead to a compromise of an investor’s financial objectives. One of the main reasons investors set these unreal expectations is simply a lack of awareness. For example, just because a stock price has doubled in a year’s time does not mean that it will double next year as well; though some investors believe otherwise. Even if a few mutual funds have 60 percent returns last year, expecting them to do the same the following year is an unrealistic expectation. There are various asset classes where investors tend to have unrealistic expectations that lead them to make poor investment decisions, and real estate is one of them. While many real estate investors make high returns, there are some investors who have lost money — or are still losing money — on their real estate investment. Therefore, it is crucial that an investor makes a well-researched investment decision with an appropriate time horizon that fits their needs and wants. In order to achieve optimal asset allocation, investors must first have established realistic return expectations. Many investors will change their asset allocation based on market conditions, but this is a mistake. Certain market conditions can cause investors to make poor investment decisions. Actions, such as panicking during market downturns and buying frenzies during upturns, can lead investors into buying high and selling low, ultimately taking an unpreferred loss. Investors tend to sell their equity or mutual funds during a bear market. Whether this choice is made in order to prevent further losses or waiting for the market to correct further, they should consider that it is nearly impossible to time the market. Investors that continue their equity, mutual funds, and systematic investment plans in a bear market and into the bull market will typically achieve higher gains. Asset allocation adjusts the right mix of cash, equity, gold, real estate, and debt. Investors should ensure that they maintain the proper mix so they can ensure that they see consistent returns. While changing your asset allocation too much can lead to unpreferred losses, not changing it at all is also a mistake, especially for those investors who are nearing their financial goals. In order to mitigate risk, investors need to shift their asset allocation to less risky assets when nearing their financial goals. Of course, if financial goals ever change and investors want to be more conservative with their investments, they can always alter their asset allocation decisions to fit their unique needs. As you can see, there are plenty of mistakes that investors can make when it comes to asset allocation. 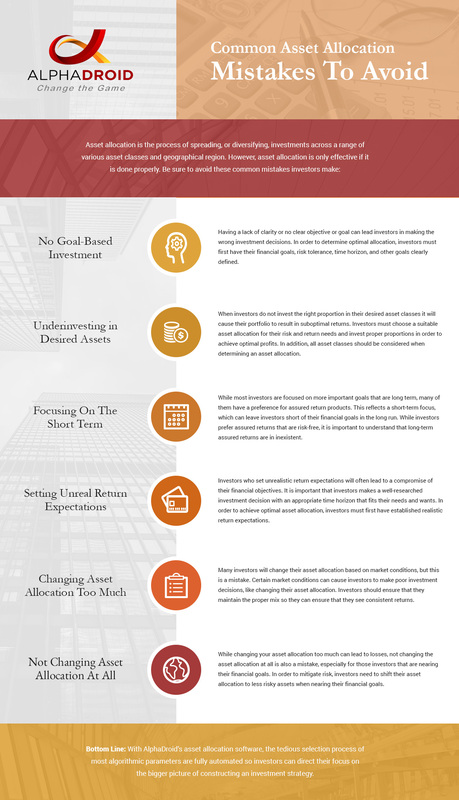 Investors should first educate themselves about an appropriate asset allocation decision that is consistent with their risk profile, as well as the various factors that could potentially impact the returns of their assets. Simple asset allocation mistakes can lead investors to experience unpreferred losses. With AlphaDroid, the process of asset allocation has been simplified, allowing investors to focus their attention on the bigger picture of investment strategy construction. AlphaDroid’s asset allocation software eliminates the tedious selection process of most algorithmic parameters by making it fully automated. In addition, with AlphaDroid, investors can use 500 active investment strategies for managing client accounts, as well as 300 sandbox strategies for creating and testing new asset allocation strategies. To learn more about AlphaDroid’s asset allocation software, contact us today or start your free trial.